There was no point at which Martyn Mackrill (b. 1962) consciously made a decision to become a marine painter. Born on the Isle of Wight where he is still resident, the son of a marine engineer in the Merchant Navy and a grandson of the owner of a fleet of trawlers, his earliest days were spent around boats and harbours, and drawing and painting his surroundings came as a natural extension to this way of life. His obvious artistic ability led to him studying art at Portsmouth Art College and was followed up by a course in model making at Sunderland Polytechnic. Early sales of his marine watercolours encouraged him to pursue marine painting as a career and he has also pursued his interest in sailing. He and his wife have lovingly restored a 1910 gaff-rigged cutter called Nightfall. For Mackrill, as for many yachtsmen, the late-Victorian, early-Edwardian periods are looked on fondly as a golden age of yachting. Owned by an elite including members of the Royal Houses of Europe, and raced by skippers and crews often made up of fishermen motivated by the promise of a share in the prize money, such vessels offer not only elegant lines and superb craftsmanship that are pleasing to the eye, but represent the thrill of competition and the spectacle of man struggling against the elements. 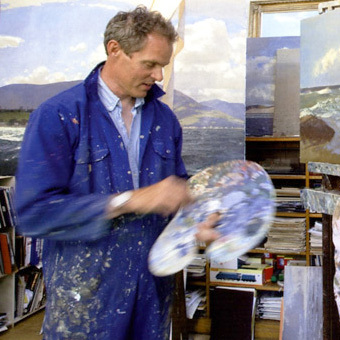 Martyn Mackrill is Honorary Painter to the Royal Thames Yacht Club and is represented exclusively by Messum’s.